As we conclude our mini-series on the Genesis accounts of creation and the fall, I would like to ponder God’s magnificent work. We are not here by accident; God has carefully arranged things so that we can exist and flourish. In this regard, I have written a good bit over the years about what is known as the “Rare Earth Hypothesis.” Let’s review some of the basics of this hypothesis. While most people, including most scientists, believe that there may be billions of inhabitable planets capable of sustaining complex life, the Rare Earth Hypothesis suggests that such a large number is overstated. Earth is at just the right distance from the Sun so that water is warm enough to melt, but not so hot as to boil and steam away into space. Water is also able, in this habitable zone (the so-called “Goldilocks” region), to both evaporate and condense at lower levels in the atmosphere, thus permitting a more even distribution of water, and the cycle of water over dry land known as precipitation. For suns to spawn Earth-like planets they must have sufficient “metallicity,” which is necessary for the formation of terrestrials rather than gaseous planets. Earth is in a “habitable zone” within the galaxy as well. Closer to the center of galaxies, radiation and the presence of wandering planetoids make life there unlikely. Earth exists in a disk-shaped spiral galaxy (the Milky Way) rather than in an elliptical (spheroid) galaxy. Spiral galaxies are thought to be the only type capable of supporting life. Earth’s orbit around the sun is an almost perfect circle rather than the more common “eccentric” (elongated) ellipse. Steep elliptical orbits take a planet relatively close to and then relatively far from the sun, with great consequences for warmth and light. Earth’s stable, nearly circular orbit around the sun keeps our distance from it relatively constant, and hence the amount heat and light does not vary tremendously. Two nearby “gas giants” (Jupiter and Saturn) attract and catch many wandering asteroids and comets and generally keep them from hitting Earth. The asteroid belts also keep a lot of flying rock in a stable orbit and away from us. Our molten core creates a magnetic field that holds the Van Allen radiation belts in place. These belts protect Earth from the most harmful rays of the sun. Earth’s volcanism plays a role in generating our atmosphere and in cycling rich minerals widely. Our sun is just the right kind of star, putting out a fairly steady amount of energy. Other types of stars are more variable in their output and this variance can utterly destroy life or cause it to be unsustainable due to the extremes caused. Earth’s fairly rapid rotation reduces the daily variation in temperature. It also makes photosynthesis viable because there is enough sunlight all over the planet. Earth’s axis is tilted just enough relative to its orbital plane to allow seasonal variations that help complex life but not so tilted as to make those variations too extreme. Our moon also has a good effect by causing tides that are just strong enough to permit tidal zones (a great breeding ground for diverse life) but not so severe as to destroy life by extreme tides. There are many more items on the list (see the first video below), but allow these to suffice. The conditions that come together on this planet such that it is capable of sustaining complex life are complicated, remarkable, and some argue rare in the universe. The ability to support life here is the balance of many fascinating things. We cannot but be amazed at the complexity of life and the intricacies required for it to flourish here. It would appear that for complex life to be sustained, many factors must come together in just the right way. The sheer number of these factors sharply decreases the number of possible Earth-like planets, despite the billions of galaxies and stars. All this background information leads us to a blog at discovermagazine.com: Earth-is-a-1-in-700 quintillion kind of place. (700 quintillion is 7 followed by 20 zeros!) The blog references a study by Astrophysicist Erik Zackrisson from Uppsala University in Sweden. Zackrisson’s work suggests an alternative to the commonly held assumption that planets similar to Earth must exist, based on the sheer number of planets out there …. Current estimates hold that there are some 100 billion galaxies in the universe containing about 10^18th stars, or a billion trillion …. Probability seems to dictate that Earth-twins are out there somewhere. But according to Zackrisson … Earth’s existence presents a mild statistical anomaly in the multiplicity of planets …. Most of the worlds predicted … orbit stars with different compositions—an important factor in determining a planet’s characteristics. His research indicates that, from a purely statistical standpoint, Earth perhaps shouldn’t exist …. Researchers are confident in the broader implications of their model: Earth is more than your garden-variety planet. I write on this topic more in wonder and awe than anything else. Our faith does not require that we believe ourselves alone in the universe. God can, and even might have, created intelligent beings on other planets, beings with whom He interacts and whom He loves. Neither should we too quickly assume that Earth is not a rare jewel. Statistically, it would seem that we and Earth are rare jewels. Humble amazement at all that it takes to sustain life on our planet is a proper stance at this stage of the evidence. The more we learn, the more it seems that the convergence of all the factors we enjoy on Earth is rare rather than commonplace. Consider well all that God and nature—sustained by God—have done so that you and I can exist. Be amazed; be very amazed! It snowed yesterday in Washington, D.C. It wasn’t anything epic, just a decent six-incher. There were drawbacks, of course: Mass attendance was poor, and I had to get up early to shovel a path to the doors. (Thank you, Lord, for the helpers you sent!) Despite the inconvenience, snow incites wonder and awe in me. The mind is baffled by its steady fall. What Does the Christian Tradition Mean by the Word “Mystery”? In the secular world, a “mystery” is something that baffles or eludes understanding, something that lies undisclosed. And the usual attitude of the world toward mystery is to solve it, get to the bottom of, or uncover it. Mysteries must be overcome! The riddle, or “who-done-it” must be solved! In the Christian and especially the Catholic world, “mystery” is something a bit different. Here, mystery refers to the fact that there are hidden dimensions in things, people, and situations that extend beyond their visible, physical dimensions. Mystery is that which opens temporality and gives it depth. It introduces a vertical dimension and makes of it a time of revelation, of unveiling. And thus there is a hidden and richer meaning than meets the eye. This is mystery, something hidden, something that is accessible to those who know and are initiated into the mystery and come to grasp some dimension of it; it is the deeper reality of things. In terms of faith there is also a higher meaning to mystery. Le Croix added the following to the definition above: It [mystery] introduces a vertical dimension, and makes of it a time of revelation, of unveiling. Hence we come to appreciate something of God in all He does and has made. Creation is not just dumbly there. It has a deeper meaning and reality. It reveals its Creator and the glory of Him who made it. The heavens declare the glory of God; the skies proclaim the work of his hands (Psalm 19:1). In the book of Sirach, after a long list of the marvels of creation, is this magnificent line: Beyond these, many things lie hid; only a few of God’s works have we seen (Sirach 43:34). Indeed, there is a sacramentality to all creation. Nothing is simply and dumbly itself; it points beyond and above, to Him who made it. The physical is but a manifestation of something and Someone higher. In the reductionist world in which we live, such thinking is increasingly lost. Thus we poke and prod in order to “solve” the mysteries before us. And when have largely discovered something’s physical properties we think we have exhausted its meaning. We have not. In a disenchanted age, we need to rediscover the glory of enchantment, of mystery. There is more than meets the eye. Things are deeper, richer, and higher than we can ever fully imagine. Scripture, which is a prophetic interpretation of reality, starts us on our great journey by initiating us into many of the mysteries of God and His creation. But even Scripture does not exhaust the mystery of all things; it merely sets us on the journey ever deeper, ever higher. Mysteries unfold; they are not crudely solved. For the Christian, then, mystery is not something to be solved or overcome so much as to be savored and reverenced. To every person we know and everything we encounter goes up the cry, O magnum et admirabile mysterium (O great and wondrous mystery)! Now you’re becoming a mystic. Cross-posted at the Catholic Standard: What Does the Christian Tradition Mean by the Word “Mystery”? Have You Ever Really Seen the Stars? One of the central elements in the Epiphany story is the star. There are numerous theories as to what exactly it was. It may not have been a star at all, but Jupiter or Saturn, which are said to have come quite close to Earth around the year 6 B.C. I thought of that the other day because Jupiter is currently bright in the southeastern sky a couple of hours before sunrise along the East Coast of the U.S. With high-powered binoculars one can even see some of its many moons. Most of us city dwellers have no idea what we’re missing when it comes to the night sky. Up until about a hundred years ago the night sky was illuminated with thousands of points of light, a breathtaking display many moderns have rarely if ever experienced. My first and only real glimpse of the magnificent Milky Way was about 20 years ago. I was visiting a priest friend in rural North Dakota in mid-January, and the sky was cloudless, the temperature just below zero, and the humidity very low (thus, no haze). We decided to go for a nighttime walk away from the town. After we’d gone about half a mile I happened to look up; I couldn’t believe my eyes! “What do you mean? There are no clouds,” he replied. “Then what is all that?” I asked, pointing upward. I was astounded by the sight, but at the same time I felt a bit angry that I’d been deprived of such a view all my life. Is this what the ancients saw every night? This must be what inspired the psalmist to write, The heavens declare the glory of God, the firmament shows forth the work of His hand … night unto night takes up the message (Ps 19:1ff). This must be what God meant when he told Abraham, “Look up at the heavens and count the stars—if indeed you can count them.” Then he said to him, “So shall your offspring be” (Gen 15:5). If there is ever a widespread power outage on the East Coast, I pray it will happen on a cloudless, dry night. If it does, I will bid my neighbors to join me outside and behold the gift above. The second half of this next video shows some wonderful high-definition pictures of the stars in the night sky. If your monitor is a good one, you might want to maximize the view—it displays nicely even on large screens. Cross-posted at the Catholic Standard: Have You Ever Really Seen the Stars? I open our New Year’s Eve late night Mass (11:15 PM) with the observation that we begin Mass in one year and end in the next. 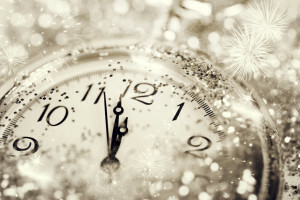 New Year’s Eve highlights the mysterious passage between years. In a way I suppose it is no more mysterious than the passage from Thursday to Friday or from 10:00 AM to 10:01 AM. In one sense, nothing could be simpler than time. I might ask you, “What time is it?” You might reply, “It’s 1:15.” Simple! But time has mysteries about it. What is time? Some say it’s merely a measure of change. But that doesn’t really make a lot of sense because change doesn’t occur at a steady pace at all. Some say it’s just another way of measuring distance in the space-time continuum. Time and distance are certainly related. To look out at the stars at night is to look into the past; it has taken millions of years for the light from some stars to reach us over vast distances through the vacuum of space. Even the light from our sun is eight minutes old before it reaches us. But there’s more to time than distance and we all know it. There are several different words for time in Greek. Chronos refers to clock time. Kairos encompasses a complex notion of time experienced subjectively. Sometimes ten minutes can seem like an hour, but there are other times when an hour can pass by swiftly. Further, things can seem fitting at certain times but not at others. Kairos thus expresses an elastic notion of time. Lastly, there is aeon (eternity, or the fullness of time). I’ll comment more on aeon below. Every year at this point I ponder the mystery of time, probably because time is so much on our minds. As I do so, I am mindful that most of us think we know what time is until we’re asked to define it in some meaningful way. It reminds me of what St Augustine once said about another mystery: the Trinity. If someone asks me to define time I am tempted quote St. Augustine: “If you don’t ask me, I know. If you ask me, I don’t know.” So time, while plain and simple at one level is mysterious at others. The Mystery of Time’s Elasticity – We like to think that time is unvarying, that 10 minutes here is the same as 10 minutes there. But science has largely disproved that. For example, as an object approaches the speed of light, time slows down. Further, strong gravitational forces also slow down time. On a very large planet with strong gravitational forces I would age less rapidly than on a smaller planet. Granted, it would take a huge difference in speed or gravity to be able to observe much of a difference, but the law of relativity does demonstrate that time does not pass equally everywhere. In a way, it is almost like a comparing a large, lumbering elephant to a tiny mouse. As the mouse scurries across the floor (pursued by my cat!) its speed is amazing, almost as if the mouse were operating in a different time frame. The Mystery of Life Spans – Why are the life spans of different species so different? Like me, my cat Daniel is a mammal; our physiology is quite similar in most respects. Yet his clock is likely to expire after about 15 years while mine is more likely to make it closer to 80 years. Certain turtles can live up to 150 years. Many types of parrots can live to be over 100, while other birds live only 10 to 15 years. Most fish live only a few years, but carp can live up to 100 years. We all seem to have a clock, a designated life span. But that life span seems quite variable even among very similar animals. We seem to carry the mystery of time within us. I have never heard a satisfying explanation of the wide variability in life spans. The Mystery of our “Inner Clock” – Most of our demarcations of time are clearly rooted in the celestial cycle. A day is the cycle of the earth rotating on its axis. A year is the cycle of the earth orbiting the sun. A month (a least originally) is rooted in the cycle of the moon orbiting the earth (“month” is just a mispronunciation of “moonth”). Seasons result from the earth’s trajectory around the sun as well as the tilt of the earth’s rotational axis in relation to the plan of its orbit. More mysterious is the 7-day cycle we call the “week.” Where does it come from? Human beings in most cultures seem to have a need to “reset the clock” every seven days. The Genesis account of creation in seven days, surely influenced the Judeo-Christian culture, but other cultures show a similar tendency toward seven days. Where does the seven-day week come from? It’s mysterious. As humans, we seem have some inner clock that needs resetting at about that frequency. The Mystery of Eternity – Lastly, there is the mystery of what we call “eternity.” Most people misunderstand the word simply to mean a very long time. But that is not what is meant by the word. When the Greeks coined the word eternity (aeon) they meant by it “the fullness of time.” Eternity is the past, present, and future all being experienced at once. I cannot tell you what this is like but I can illustrate it. Look at the graphic of the clock at the upper right. It shows 2:00 (let’s assume in the afternoon). That means that 10:00 AM is in the past while 6:00 PM is in the future. But consider the dot at the center of the clock. At that spot, 10:00 AM, 2:00 PM, and 6:00 PM are all the same; they are equally present to the center. We live our life in serial time, on the outer edge of the clock. But God does not; He lives in eternity. God lives in the fullness of time. For God, the past and the future are the same as the present. God is not “waiting” for things to happen. All things just are. God is not waiting and wondering whether you or I will get to Heaven. He is not watching history unfold like a movie. In eternity, thousands of years ago is just as present as is thousands of years from now. Scripture hints at God’s eternity in numerous passages. But do not ignore this one fact, beloved, that with the Lord one day is like a thousand years and a thousand years like one day (2 Peter 3:8). And then there is simply the God’s name: “I AM.” In this name there is no past and no future, just an eternal now (the present tense). Jesus declared to the crowds, Before Abraham ever was, I AM (John 8:58). So here is the most awesome mystery of time: the fullness of time, eternity. Ponder God’s glory and the mystery of time! What Is the “Dark Energy” That Scientists Seek to Measure and Define? In 1929, Edwin Hubble discovered that the universe was not static but was in fact expanding outward from some point of singularity. At first his fellow scientists ridiculed his theory, labeling it with the term “the big bang.” Even as late as the 1960s I remember being taught in school that the universe was eternal and fixed. That “settled science” has since given way to the current view that the universe is expanding outward—quite rapidly, in fact. There is more, however: a mysterious factor called “dark energy” complicates things. If we think of the analogy of an exploding Fourth of July firework, we observe that its rapid outward expansion decelerates as the force of gravity slows and then finally halts its outward motion. Similarly, as our universe expands outward we would expect to see some slowing in the rate of its outward expansion as stars and galaxies exert their gravitational forces. However, measurements indicate that expansion is not slowing down; it’s speeding up. Many scientists attribute this to “dark energy.” It is called “dark” because it is poorly understood. Its effects can be observed, but what “it” is remains a “dark” or mysterious reality. Hmm, the universe is speeding up as it expands. This is rather counterintuitive! So, what is this dark energy that causes the universe to expand ever more rapidly? The answer is love. God, who is love, created all things in love by the powerful effect of His love and Word diffusing outward. Love does not diminish but intensifies and multiplies as it is shared. Love is effusive of itself. It seeks to share and multiply. Adam and Eve are told to be fruitful and multiply in marital love. Yes, love expands and intensifies if it is offered and received generously. In a finite world, we tend to think of everything in it as part of a zero-sum game. So, if I take something, there is less of it for you. Love is not that way. Hugs multiply when shared. A small act of kindness can have great effect, far beyond its initial limited scope. Knowledge is this way, too. We think that if we learn one thing, then the number of things to learn decreases; in fact, the questions simply multiply and grow more urgent. As a picture of love, consider the Easter Vigil. From one small flame atop the Easter candle every other candle held by the faithful in the church is lit and shared, and yet the flame of the Easter candle is in no way diminished or dimmed. It is “a flame divided but undimmed.” As that light goes outward, the church brightens more rapidly as the light is shared by more and more people in the congregation. Yes, the speed at which the light (Christ) goes out increases as it is shared by more and more. This is a small picture of our universe. This is why the universe expands more rapidly as it goes outward: Love, God’s love! Please understand the humility and lightheartedness with which I offer this explanation. I speak as a “theologian” and look to formal and final causalities. I am under no illusion that the physical sciences can accept my answer; they deal primarily in material and efficient causality and must stay within those limits and work with those premises. Theology, however, based on revelation, can enter into formal and final causality. To you who believe I have this message: Do not ever forget that everything you see in the abundance of the universe and in its astonishing size and speed is rooted in a creative act of love by God, who is love. You are not simply walking around in a machine; you are walking about in an act of love that is sustained by love. Yes, love, that is the answer!